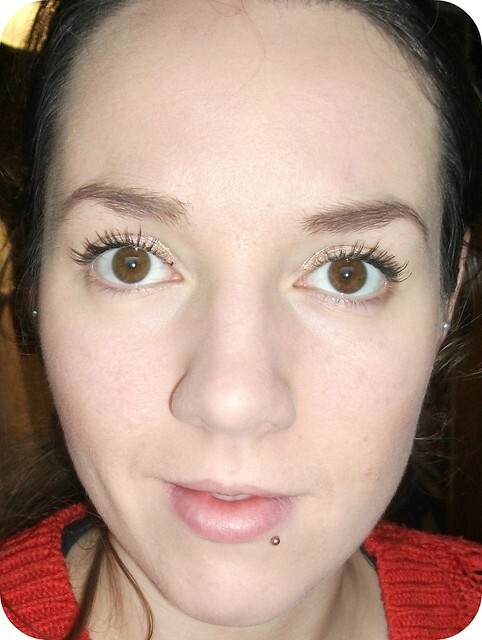 Hello and welcome to my first beauty review of 2015, and we're starting as we mean to go on with a budget-friendly mascara - but is it worth spending your cash on? 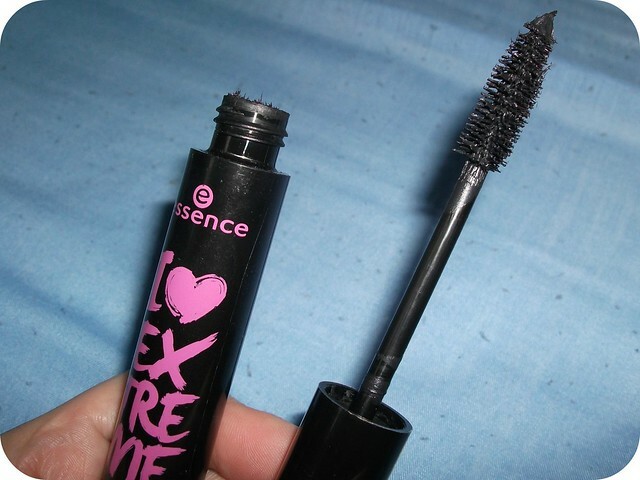 I received Essence's I ♥ Extreme Volume Mascara as part of a giveaway prize last year, and have been using it as my day-to-day mascara for the past few weeks. "Mascara for extreme volume; ultra black; ophthalmologically tested." First things first, I can't help but think the tube is just too chunky, I can't see why it needs to be so fat - it makes it harder to store and means it takes up more space in my make-up bag so it's less than ideal for travelling with. Maybe a minor thing but the little things can add up! That aside, the packaging is quite nice, with the product name printed in hot pink on the black tube - simple but effective. The wand features a standard brush-style application - none of these new-fangled plastic combs or spoon-shaped things here! - though the brush is a little on the larger side. I'm lucky in that I have quite long lashes as it is, so in a mascara I'm generally just looking for a jet-black colour and a nice amount of volume, rather than anything extreme in terms of added length. 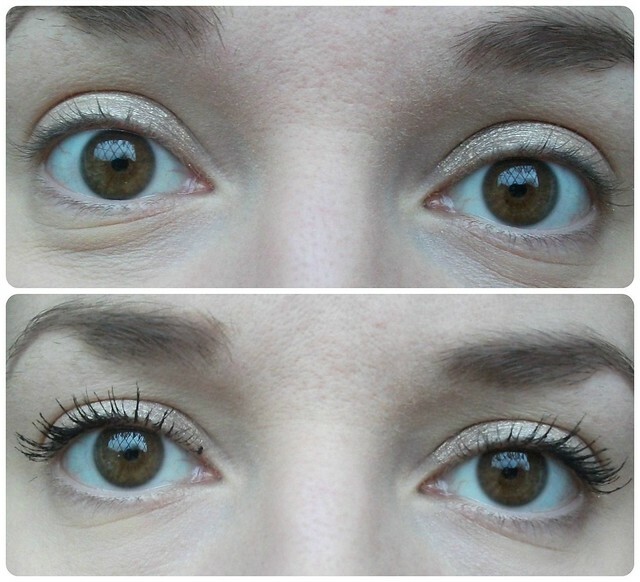 For me, though, I felt that this mascara actually made my lashes look shorter somehow. Seriously, I don't know how it would achieve that, but everytime I apply it I feel like my lashes end up looking kinda stumpy...?! I should mention that this mascara lasts well - I've not experienced any flaking or smudging, even when wearing it for 14+ hours - and removes reasonably well with an eye make-up remover on cotton pads. I do get a nice dark, black colour but, rather than adding volume as it claims, it has a tendency to clump a little if you try to apply more than one coat, and that alongside the fact that it somehow manages to make my lashes look shorter means this isn't a winner for me! All in all, the little things have added up to make this a pretty poor offering as far as I'm concerned; the excessively chunky tube, the mascara blobs not being removed from the wand, and the way it looks on my lashes, mean I won't be repurchasing this and I don't really feel like I could recommend it, though I wouldn't be put off trying other Essence mascaras as for the price they have the potential to be an absolute bargain! 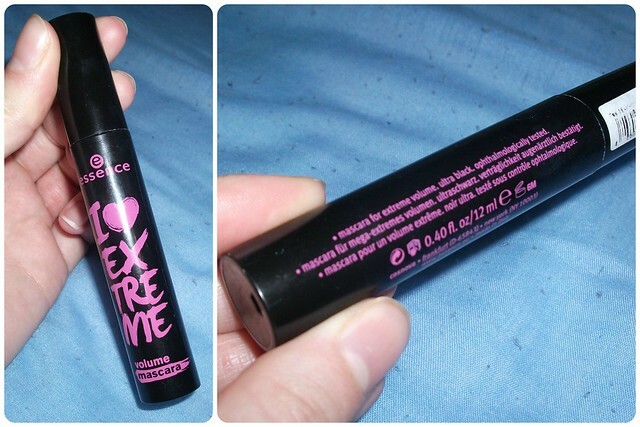 Have you tried Essence's I ♥ Extreme Volume Mascara? Did you have a similar experience? Would you recommend any other Essence mascaras, or should I give them a miss? This mascara is fantastic ! Such a shame you didn't like this mascara, I do like my mascaras to give me a lot of volume. It's a shame you didn't like it, but personally I don't think it looks too bad! Maybe apply a little to the lower lashes too, to see if it'll make a difference? Hope your next Essence beauty buy will be more successful! Yeah I find essence products to be a bit hit and miss, although like you say, for the price you really don't mind! I love their lipsticks- if you haven't tried them yet you definitely should! Well between those two photos you can most definitely see a difference, but what a shame it isn't the one for you. I'd love to give it a go and see if it works for me or not!